We all have our favorite go-to desserts for dinner parties, casual guests, and cozy family dinners. From light fruit flavors to dense, dark chocolate, there's a delicious recipe for every palette and these authentic French desserts are no different. France is renowned for its wonderful desserts and pastries--in fact, we wouldn't have the word dessert if it weren't for the French word desservir, meaning to un-serve the main components of the meal. It wasn't long before dessert became an essential and decadent end to every dinner. Whether you're looking to learn a new cooking technique or simply want to add a touch of France to your meal, these 10 authentic recipes are the perfect introduction to traditional French desserts that your whole family will enjoy. 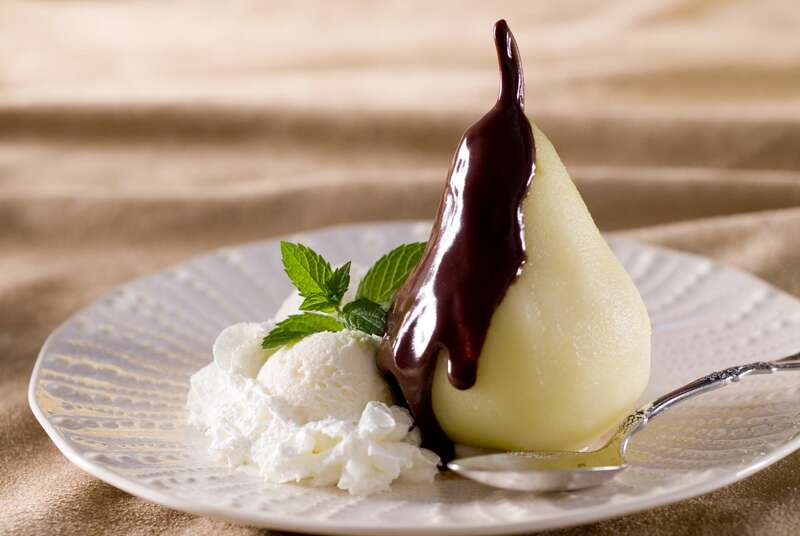 Poires Belle Helene French Pear Dessert. This classic French dessert is punched up with the essence of cinnamon. The ease of preparation and beautiful presentation make this dish a great selection for dinner parties. Adding a touch of lemon zest and spice really perks up this classically delicious apple tarte Tatin. Add a scoop of vanilla ice cream or Chantilly cream to the dessert for a rich after-dinner treat. This cherry clafoutis recipe, also know as Clafouti aux Cerises, is the most well-known version of the traditional puffed French custard cake. In France, it is customary to serve clafoutis with cherry pits intact, so be sure to warn your guests if you choose to include. Babas au Rhum are lovely yeast-risen cakes studded with dried fruit and soaked in hot rum syrup. Once the darling of French cuisine, they fell out of favor, but they're now back and better than ever. Orangettes are strips of candied orange peel dipped in dark chocolate. They are a delicious treat that makes a lovely gift when wrapped in a little cellophane and pretty ribbon. With only four ingredients, this simple recipe is easy to customize and double depending on your needs. Chocolate mousse is the quintessential romantic French dessert made so quickly and easily, what's not to like? Just carefully mix together the five ingredients before chilling for an easy no-fuss dessert you'll want to make again and again. Crème au caramel is a silky decadent dessert that's perfect for any occasion. The crème can be made up to one day in advance, making your next dessert even easier. This quintessential French tart can be found at patisseries and cafes year-round. Cool, sharp lemon filling contrasts nicely with the flaky, slightly sweet pastry. A little dollop of Chantilly cream served with the dessert makes this an ideal treat. Layers of light almond sponge cake, coffee buttercream, and dark chocolate ganache make this luscious cake recipe a show-stopping dessert. This Breton butter cake is a classic dessert in Brittany. Rich with butter and sugar, this cake needs no adornment whatsoever, although berries or whipped cream make for a special treat.